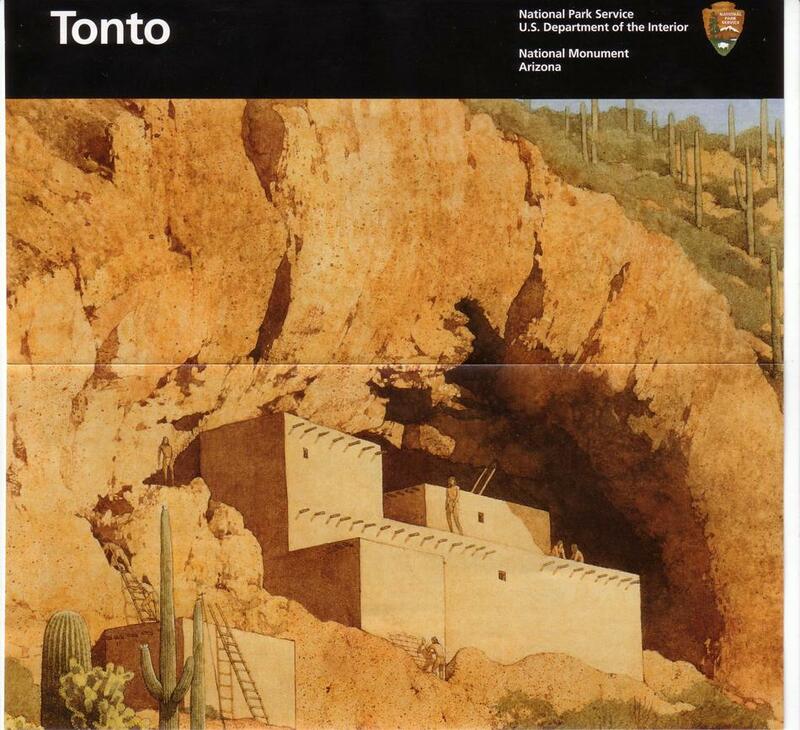 The Tonto National Monument is an Arizona icon appearing in just about every travel brochure or guidebook on the American South West. 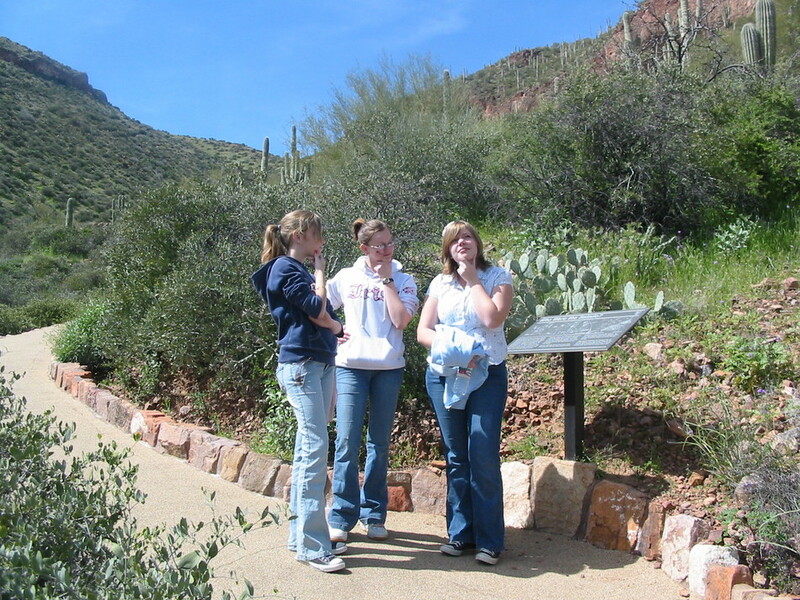 With March break in full swing and our house full of "city" visitors from Canada, a combination of Arizona scenery, history, culture, and non-strenuous exercise is in order. 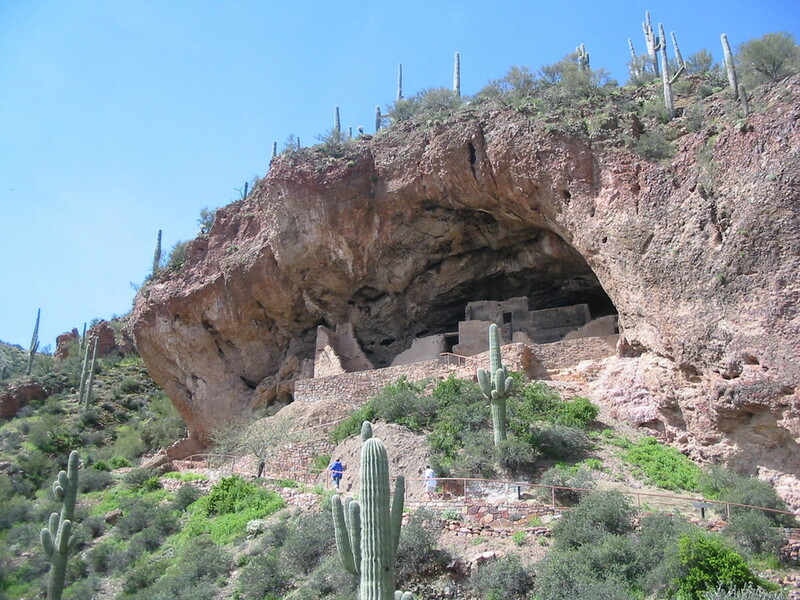 A trip to the lower cliff dwellings will score high on all 4 criteria. 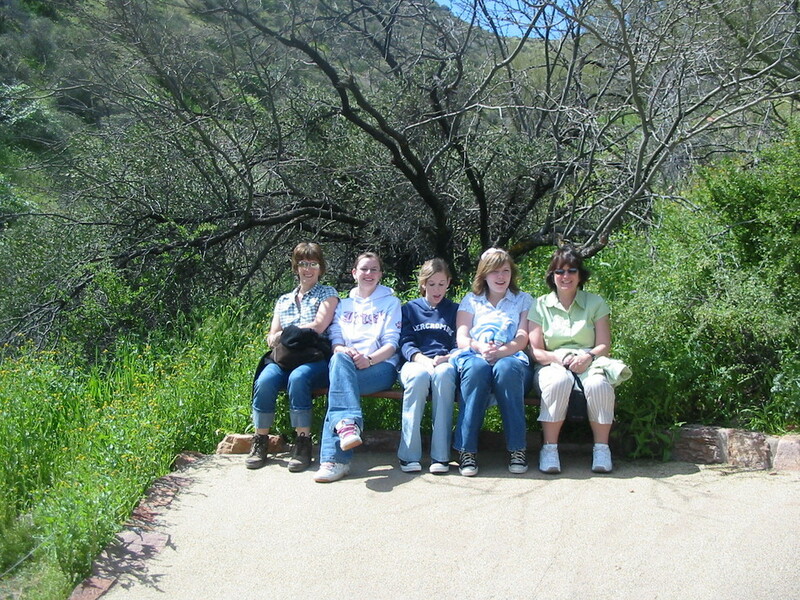 The trail to the lower cliff dwellings is paved and has park benches strategically located about every 500 feet. A series of switchbacks reduces the overall grade, but the path still has to climb 350 feet in about half a mile. Take a break at one of the park benches and enjoy the view!. Informative plaques and plant markers are generously located along the route. These certainly enhance the "educational" experience. The Lower Cliff Dwellings come into prominent view at the next-to-last switchback. This is a primo photo spot! 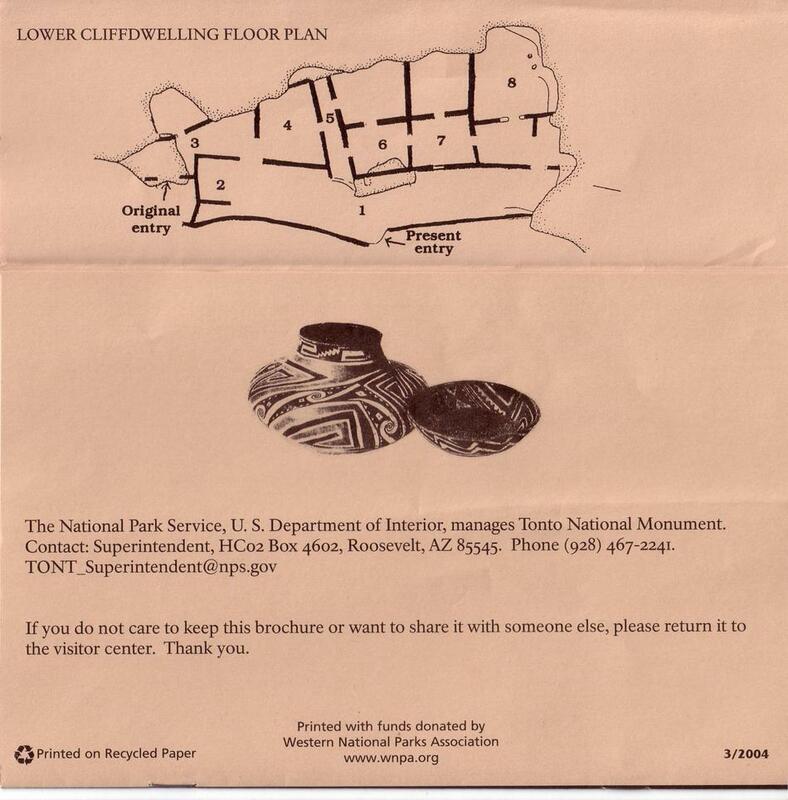 Once at the cliff dwellings, take your time exploring the 8 areas/rooms identified on the floor plan. You will discover that the extreme west side of the ruin was the original entry to the cliff dwelling. The "V-shaped" notch in the wall was the only way to enter the cliff dwelling. A removable ladder provided access. Also note the wooden beams supporting the saguaro-ribbed roof. The remains of a mano and metate (grinding stone and basin) are located in one of the more complete rooms. 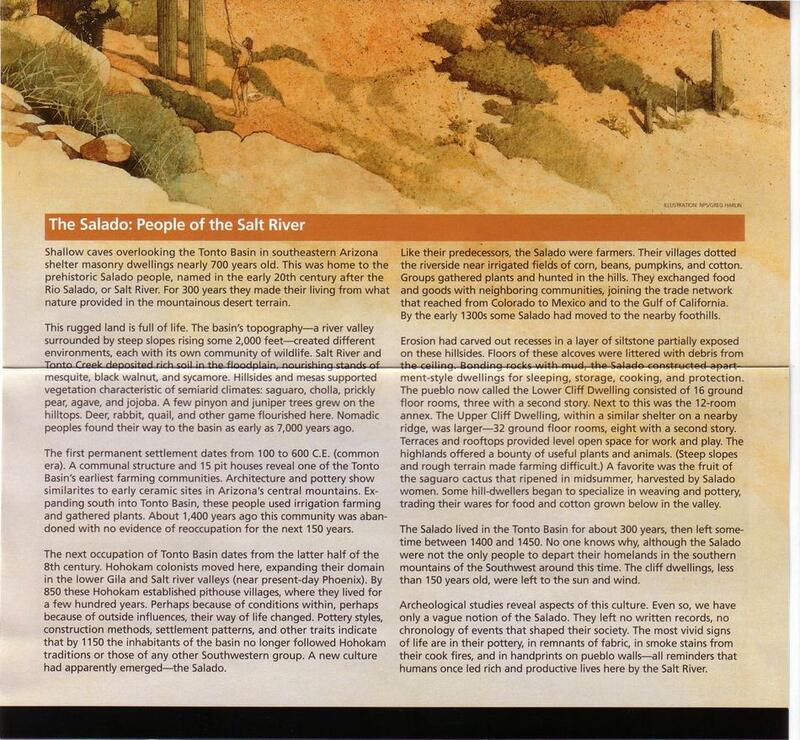 Many more factoids are shared in the NPS brochure available at the visitor's center. This easy trail is an excellent introduction to the archeological wonders of the American southwest, particularly for kids. If you have out of state visitors with varied physical capabilities or interests, this is a highly recommended destination. Enjoy! 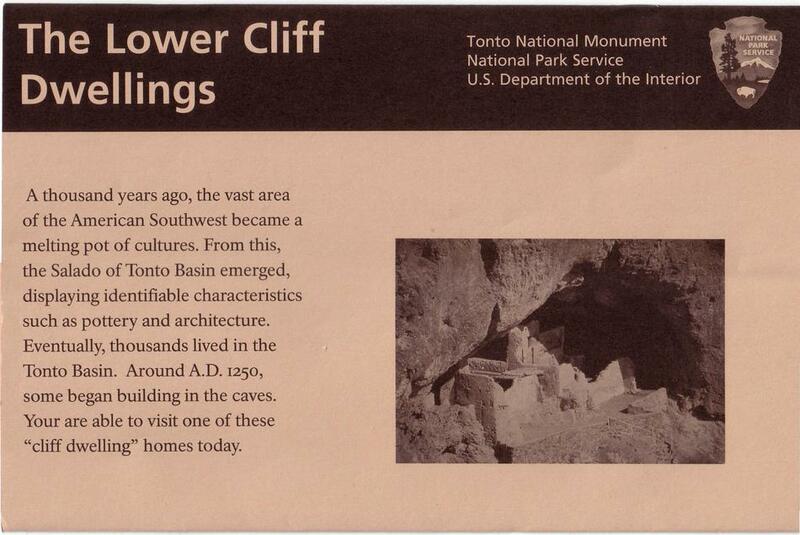 Tonto NM NPS Reports Well-preserved cliff dwellings were occupied by the Salado culture during the 13th, 14th, and early 15th centuries. The people farmed in the Salt River Valley and supplemented their diet by hunting and gathering native wildlife and plants. The Salado were fine craftsmen, producing some of the most exquisite polychrome pottery and intricately woven textiles to be found in the Southwest. Many of these objects are on display in the Visitor Center museum. From Phoenix: Take Hwy 60 (Superstition Freeway) east 75 miles to Globe/Miami. 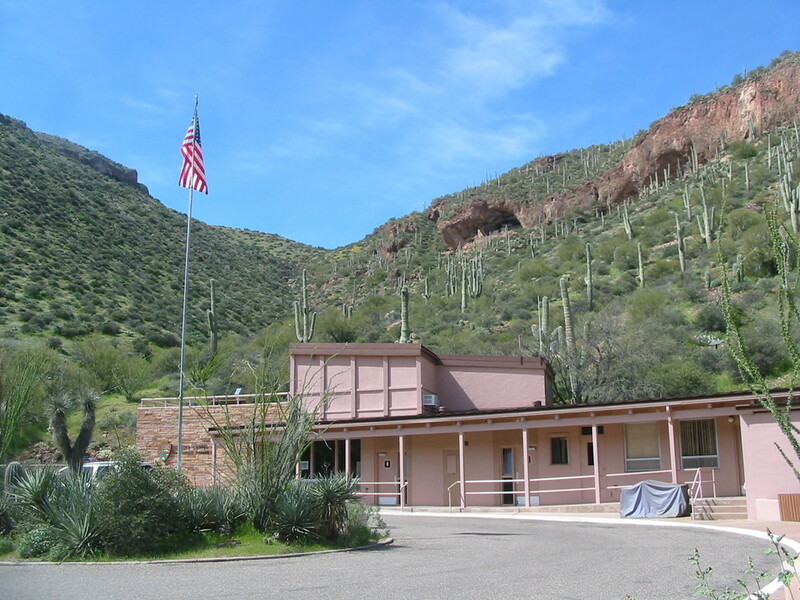 Turn left (northwest) onto Hwy 188, drive 30 miles to Tonto National Monument. From Scottsdale: Take Hwy 87 (Beeline Highway) north 80 miles to Hwy 188. 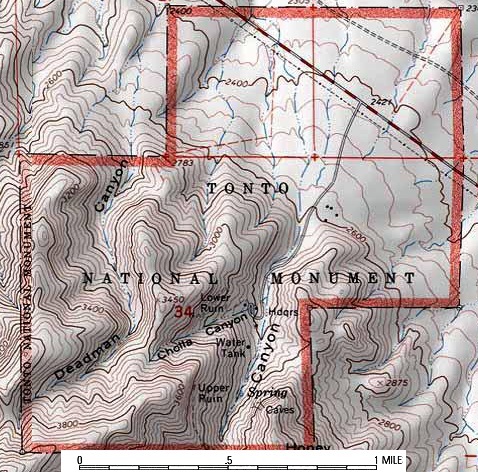 Turn right (southeast) at Hwy 188 intersection, drive 39 miles to Tonto National Monument.